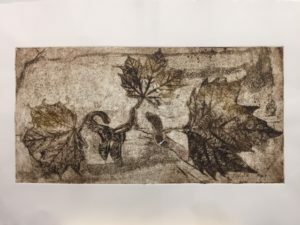 Using a variety of found items students will create a tinfoil collagraph plate and then use that plate to create prints using a printing press. Students will learn how to prepare the ink and paper, use the printing press, how to edition your prints and more. Students should bring an apron, sketchbook/notebook and some materials chosen for texture and shape (eg: crinkly crepe paper, embossed heavy paper, textured ribbon, cupcake papers, flattened leaves, feathers etc.) and an old yellow pages phone book if you have one. This course will qualify you to use the printing press on a drop in basis. Price includes all other materials.